INSIDE : Even if you live in a Rental House, you can still make your home beautiful with a fun bedroom design! 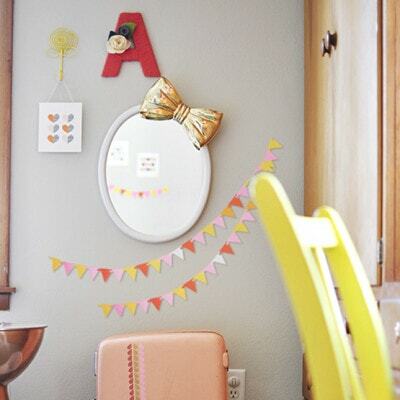 Check out how to Personalize a Little Girl’s Bedroom with fun simple ideas. We moved a few months ago across the country while my husband pursues further education. While only temporarily located here for a few years, we are renting an adorable little old house. It’s my new mission to share how to personalize and make even a rental house feel like your home because it can be done!! 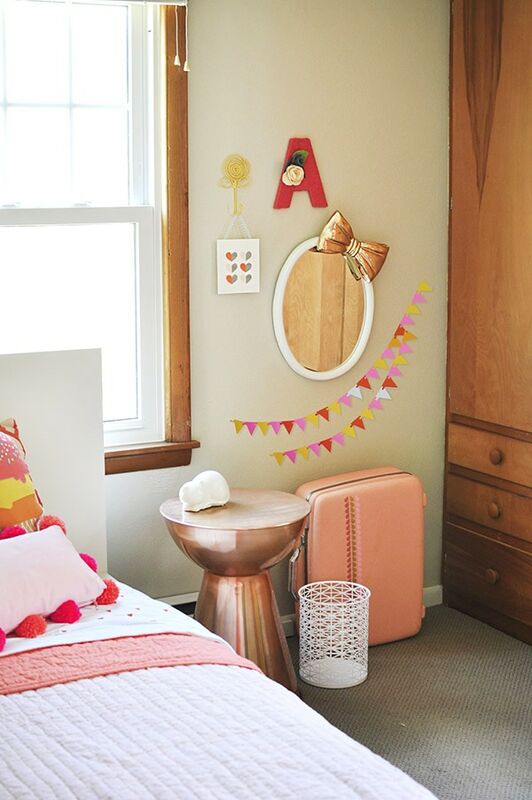 Today I am excited to share Rental House : How to Personalize a Young Girl’s Bedroom. In our previous home, my babies (a girl and a boy) shared a room. I loved having them together from the start and they enjoyed it too. However, in our rental home, I decided to make it work best for us now and our two young preschool aged children, so they now have their own rooms. 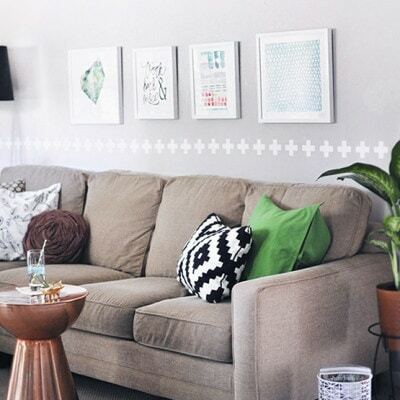 I’m here today to say, rental homes can look fun, personalized and adorable and The Land of Nod (now Crate and Barrel kids) along with some simple DIYs, helped me do it. I shared this picture on Instagram as my color scheme and inspirations for the bed room. Wow, is it a room full of bright color now! 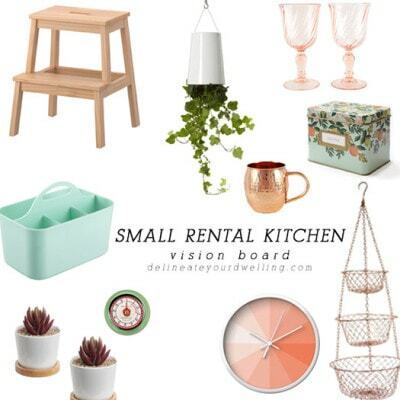 Many rentals have less than exciting walls and often that can not be changed. An easy idea to add interest to the bedroom walls is add color and texture. 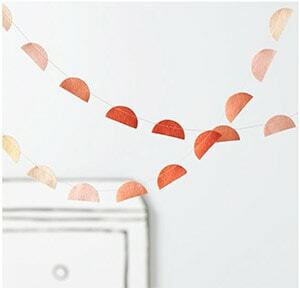 I used sticky tack and put up a few ribbons and The Land of Nod’s adorable Half Dot Peach Garland. This is one of my favorite details in the room! 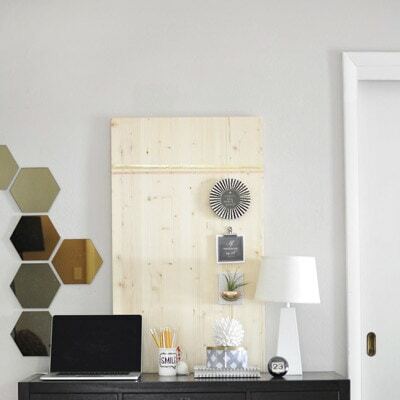 I love that it creates an accent wall without having to paint big bold polka dots everywhere. I love shopping my own home when updating rooms, too. I pulled in my painted luggage to use as extra dressup clothes storage. Along with adding color on the walls, the bedding in a little girl’s bedroom is a fun place to really add some drama. 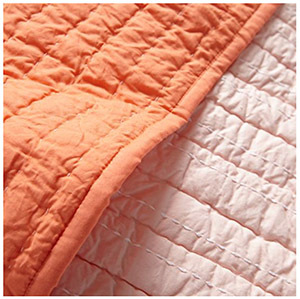 I paired a fairly simple reversible blanket (my daughter was thrilled with the pink side and I was thrilled with it’s coral side! 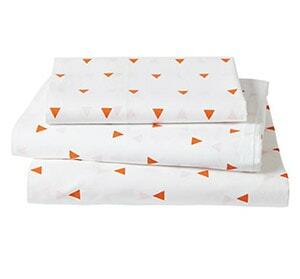 – similar here and here) with simple orange triangle sheets. 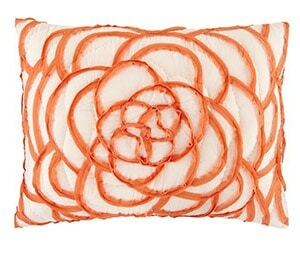 Then I added lots of colorful throw pillows, a yellow geo abstract rectangle pills (similar), a gorgeous rose ribbon sham, a whimsical ice cream cone (similar) and a fun DIY pom pom pillow I made. 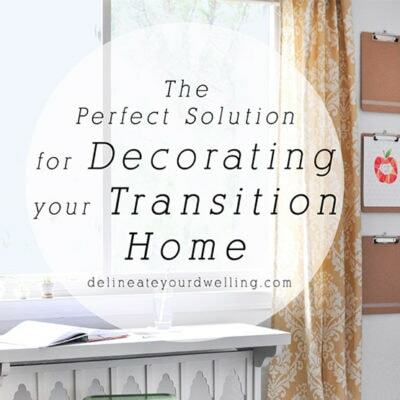 Another great tip for personalizing a rental home is the wonder of spray paint! 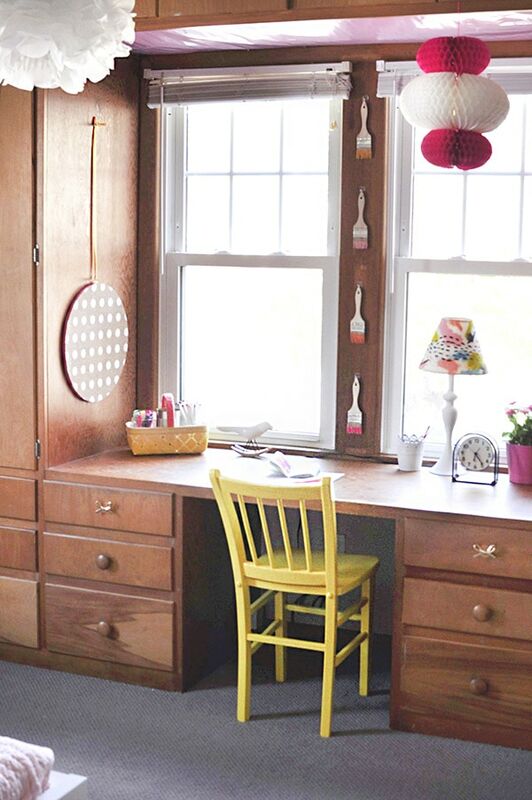 I added bright cheerful pops of yellow into the space by simply spray painting things I already owned. 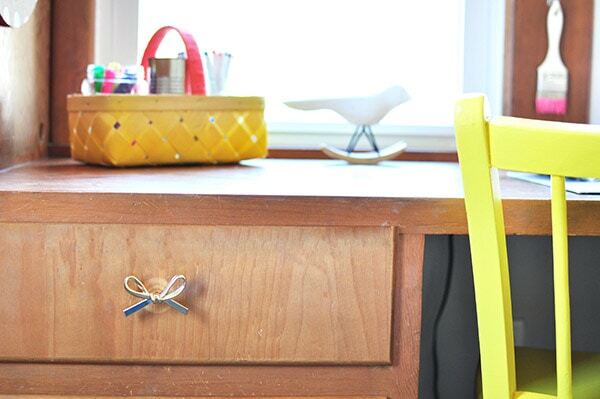 This fun floral hook got a coat of yellow and it accompanies the yarn wrapped letter I made my daughter at birth, along with one of my favorite Land of Nod items this Bow Mirror. The other side of her room is wall to wall, floor to ceiling wooden cabinetry with a built in desk. ALL of my kid’s toys are stored in the lower half of these cabinets. What I wouldn’t give to paint these cabinets a clean white, but it’s a rental so the next best thing is update the hardware with these gold bow knobs! I put one on either side of her desk area. Being four, means lots of dress up, singing Frozen and COLORING. I think she gets the creative knack from her mama because this little lady can draw up a storm! 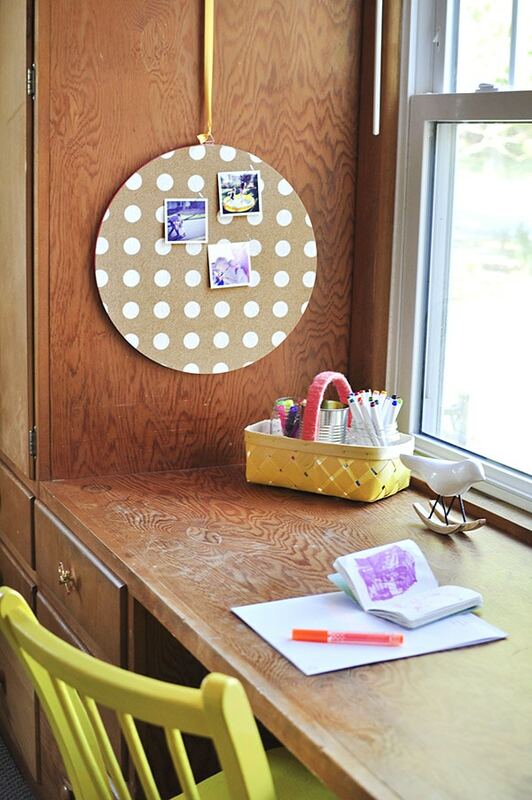 I hung this circle cork board right at her desk area to display ALL her artwork. She feels like a grownup using the few pushpins I gave her and I love that we can show off pictures and artwork alike in a pretty way. Another fun quick DIY I made for her room was the Yellow Ombre Basket. 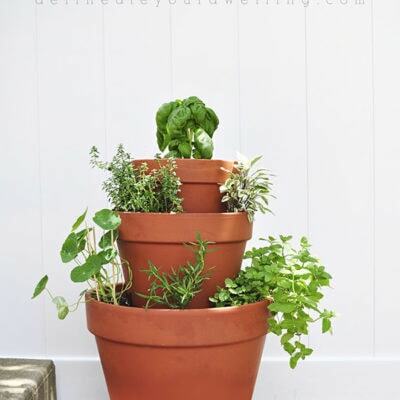 It’s a great way to store all her art supplies in a fun way. 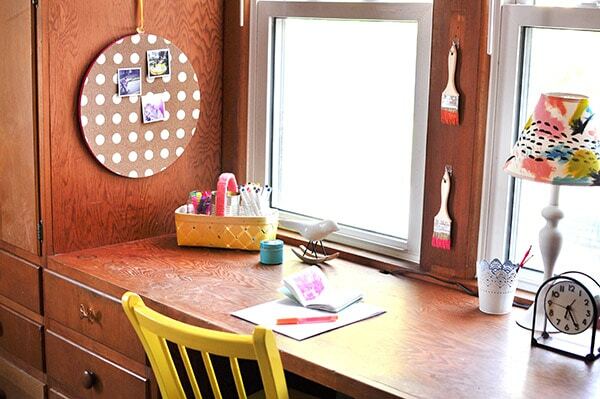 I also took the paint brushes I had saved from a homemade Twister game DIY I made and hung them at her desk area using small command hooks. No holes in the wood to worry about, but a great way to add color and inspiration to my little budding artist. This is a space she really loves spending time in. It’s chalked full of color, inspiration and yet none of which is permanent or damaging at all to our rental house! Other than the bow mirror (due to weight), everything in this room is secured with sticky tack, small push pins or command hooks. 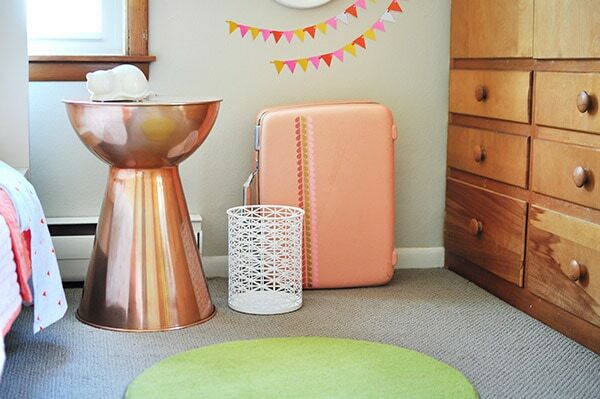 Color, texture and a few simple DIYS took this rental blah space to happy and personalized for my little girl! I’ve included a material list below. Thank you to Land of Nod (Crate and Barrel kids) for providing the product for my daughter’s bedroom. Thanks, Sam! It was a fun room to bring a little life and color to! 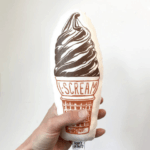 This is such a sweet idea. Everything is well organized and the colors are lovely. Nice work! Adorable! 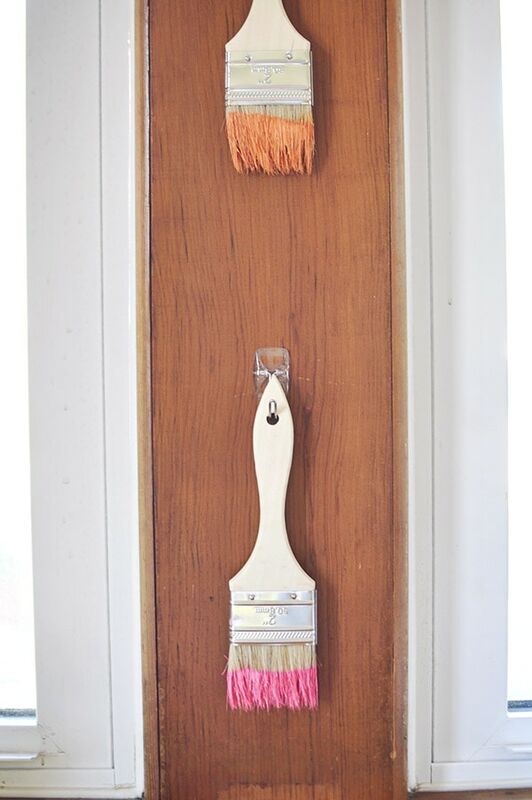 I especially love the paintbrushes and that mirror. Great job girl! Thanks so much, Ashley! It’s hard to let some stuff go since it’s just a rental but fun to make happy spaces for our kids regardless! 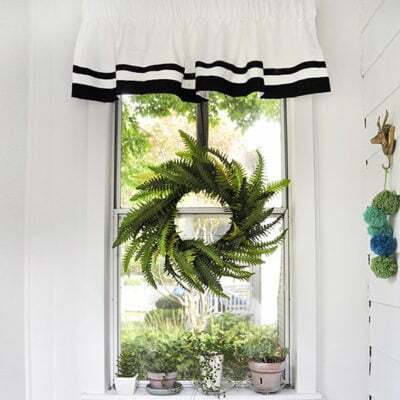 Of course the pom-pom pillow is my favorite – it looks perfect with all the other touches in the room! I’m also loving the bow mirror and the garlands, and I think those built-ins are actually pretty awesome. Great work! 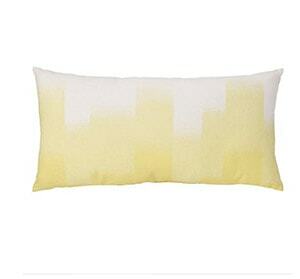 Of course the pom pom pillow is your fave! =) Aren’t those built ins awesome? I’m itching to give them some paint, but rental oh well. It was fun to pretty up my daughter’s room!! Amy, I love all of the details in this room! 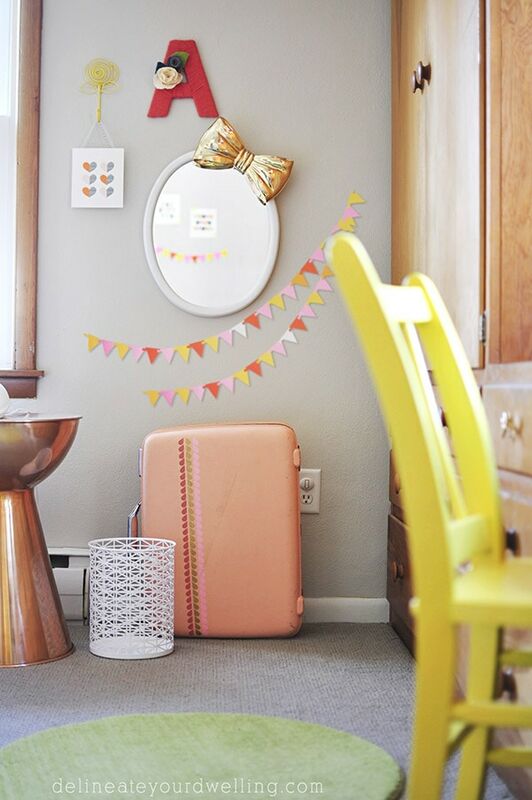 You did a great job turning a rental into a sweet, colorful, pretty space for your daughter and I LOVE all of the details! My favorites have to be the pink suitcase you painted that holds her dress up clothes, the paint brushes on the wall and the bow mirror and drawer pulls. Thanks for stopping by, friend! I couldn’t believe I still had the paint brushes from a year ago… pays to be a craft hoarder. And I agree, that gold bow mirror is my favorite LoN item!! Hi Amy, Dropping in to catch up with you. Cute room. Love the built ins the house has. Hope your enjoying your new place. Such a cute room Amy! 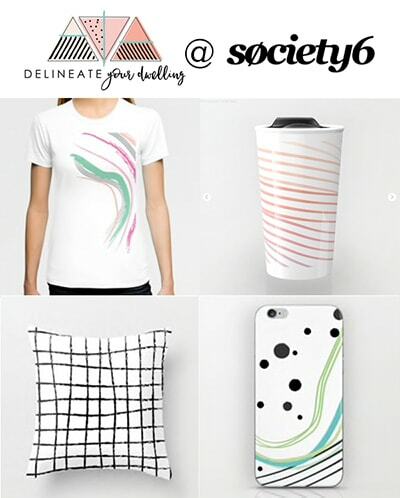 I love the colour palette you used. 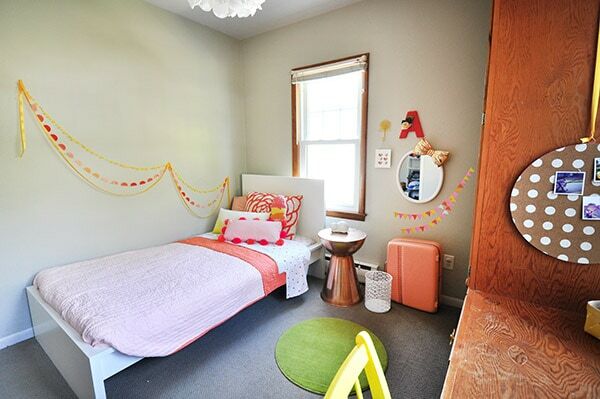 You’ve done such a great job personalizing your rental home Amy – your daughter’s room looks beautiful!! 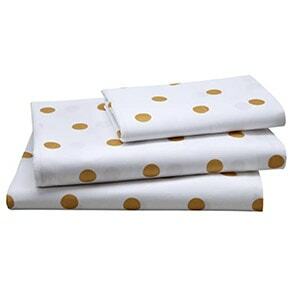 Such great ideas and I love the bedding and all the colors you chose! 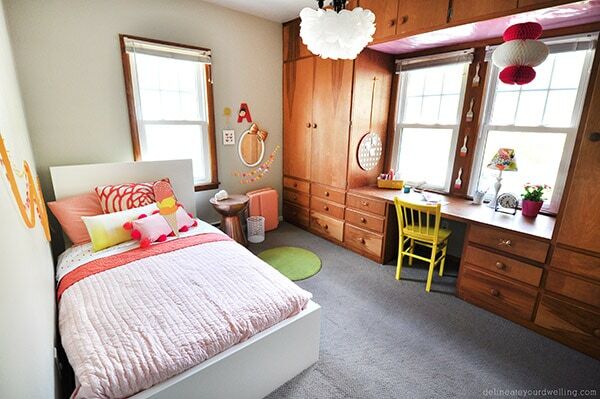 I would have loved this room as a little girl. 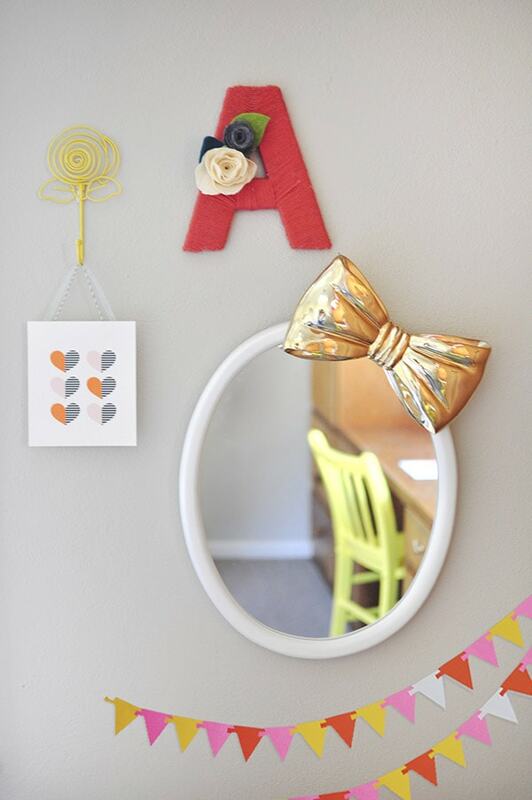 So many cute little touches in this space, love that bow mirror! 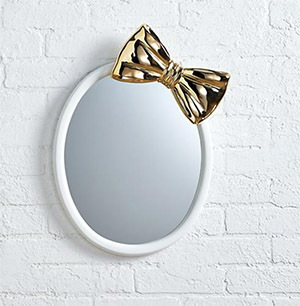 I want the bow mirror SO bad! What a cute space, Amy! 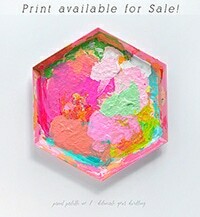 I love how you used those paintbrushes, what a creative idea. And the bows are adorable. this is the cutest girls room!!! love it so much! Ah this turned out so cute!! I love the little space next to the bed, that mirror is perfection. Amazing job! Thanks so much, Bre! I love that bow mirror, too!! Okay, so this is darling. 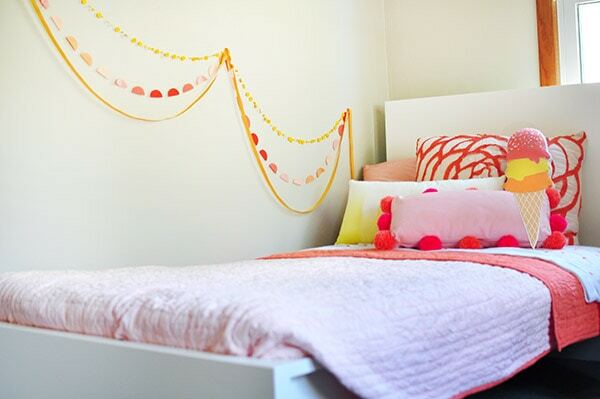 Those garlands on the wall are the cutest touch! And now I want the bedding. I think I may just have to force Vita out of the crib and into a big-girl bed!!!! I love it!! 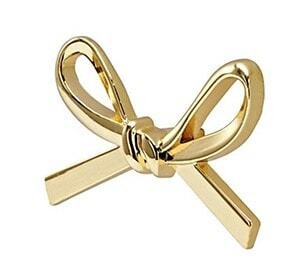 That bow mirror is soooo flipping cute!